Mr.4444 and I both turn 50 this year, and we each promised the other not to throw a party. I followed through on my end. When my sister Michelle said she was helping my brother-in-law plan a surprise birthday party for my sister Mary, I thought nothing of it. Mary's turning 60 this year, after all. However, a few weeks later, I suddenly remembered that Mary and I share a birthday week. I developed a sneaking suspicion that the party was really for me. Why? 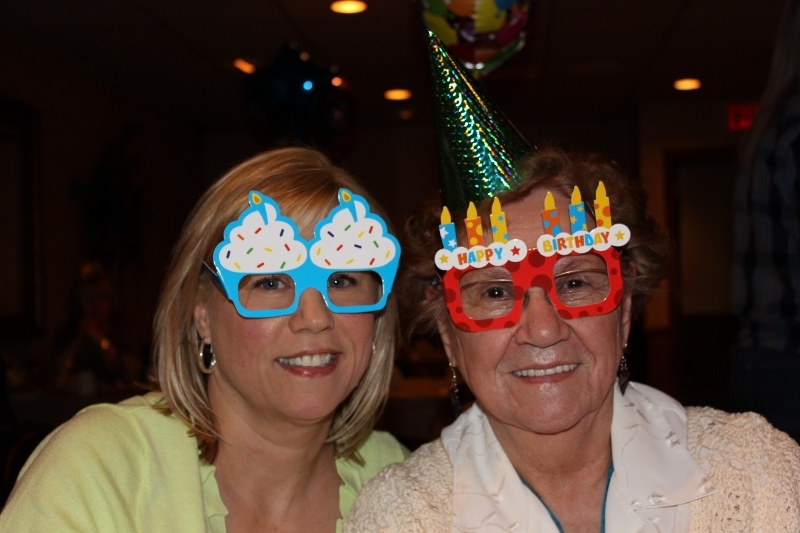 Because we threw Mary a surprise party last year (for her 59th, so she'd really be surprised). Michelle and I planned it, and Mary's husband, although encouraged to participate, did nothing to help. He didn't even return our phone calls about it. This year, suddenly he wanted to go all out and plan a surprise party for his wife? Mr.4444 had promised not to throw me a party, but Michelle hadn't. I called and confronted her. "You'd better not be planning a party for me, instead of Mary." She was cool as a cucumber, laughing even. "I swear on my children's lives," she promised. She gave me some details about the party and how some of Mary's friends were also helping with the planning. "Why do you feel so strongly about not having a party?" she asked, and I told her that I just want my 50th birthday celebration to be meaningful; I just want my birthday wish fulfilled, and that's it. "The party's for Mary," she assured me. I had no choice to accept her answer, of course, but I remained on alert, just in case. I really didn't want a party--a big waste of money to me, all of that black crepe paper, shallow and useless "You're getting ancient" paraphrenalia, etc. My birthday cake wish fulfilled is what I really wanted; I figure if you really want to celebrate my 50 years on the planet, don't buy me a present; do something meaningful. I didn't want a party. When Kendall asked if she could go visit a friend in college at Madision this weekend, I thought to myself that maybe Michelle was telling the truth; why would Kendall go out of town when a surprise party for me was planned? Or maybe she and Michelle were conspiring....really good liars! Genious, I thought; have Kendall pretend to go out of town so that she could spend the night at Michelle's and then help with the party prep the next day. It was possible. I thought about offering to help Michelle with the party planning, but if it really was my party, I didn't want to force her to lie to me or possibly get her to slip and then feel terrible. If there was a surprise party for me, I didn't want to ruin it for anyone who was planning. Who wants to be that guy?! On the big day, Saturday afternoon, as Mr.4444 and I got ready to leave for the party, I wondered what to wear. Too dressy (and no party for me) and I might feel stupid. Too casual wouldn't be good, either. I couldn't ask Mr.4444 what to wear; I didn't want to force him to slip up and feel terrible, either. I went for the middle-of-the-road. We planned to arrive at the party at 5:45pm, per instructions in the invite. "Mary" was to arrive between 6 and 6:30pm. On the way there, Mr.4444 began acting strangely; starting to yawn but not finishing. If you know him like I do, you know this was the way he used to behave when he was young, when he was trying to come off as cool but hiding something. Of course, he'd just woken up from a nap, but how many times does a person need to yawn?! He pseudo-yawned like that nine times on the way to the party (yes, I counted), each time ramping up my anxiety! They must be giving me a surprise party! Kendall hadn't really gone to Madison; she would be there to surprise me. It was killing me, because I couldn't say anything for fear that I would ruin their fun. I received a text from Kendall, excitedly telling me she was at Forever 21 and had found a cute dress to wear to her graduation. There is no Forever 21 store in Green Bay. Maybe she really was in Madison? But why would a college campus-visit weekend end up at the mall? Was this a trick? I didn't say a word; if I got Kendall to slip up and she and ended up being the one to spill the beans, she would feel horrible. I kept my thoughts to myself. Maybe the party really was for Mary. Five minutes later, Mr.4444 says, "I texted Kendall to see what she's up to, and she said she's at that Forever 21 store. When did she start liking that store; it isn't even in Green Bay, is it?" Seriously? Why would a man care about that? Were they both working to convince me that Kendall was truly in Madison? The party-fear pendulum had swung back again. A block from the restaurant, Mr.4444 suddenly gets a text on his phone and replies quickly, without saying a word; more confirmation. I became short of breath. Pulling into the parking lot, my head was reeling a little. I ducked down in the seat to busy myself with my purse; if this really was my party, I didn't want to ruin the surprise by seeing familiar vehicles. I did not want to have to pretend to be surprised after seeing Kendall's car. I was dry as a bone--super thirsty (what happens to me when I get nervous), afraid I would throw up or pass out or or something on the way inside. Was this a party for me? Was I losing my mind?! I couldn't calm down inside; I was so afraid there was a party for me. I can't remember feeling as much anxiety in my entire life. I walked in and looked around. Everyone was completely calm, cool even. My brother-in-law and nephews were sitting at the bar (getting sodas) and barely acknowledged our arrival. I headed to the adjacent room, where I saw generic "Happy Birthday" balloons on a table. A handful of people were there, and Michelle was finishing up the gift/cake table. She casually said hello and moved on to table decor. I noticed "Nifty 60" napkins and a photo of Mary as a toddler and thought, "Nice touch; they're really going all out to fool me!" The cake read "Happy Birthday Mary." In addition to a number of family members (with whom I said hi but avoided eye contact), I noticed several strangers, presumably Mary's friends. They wouldn't go that far to fool me, or would they? Ask strangers to pretend they were there for Mary and then scare the crap out of me at the last second?? I knew that was doubtful. That's when I saw the "Stuff that happened in 1953" laminated mini-poster on the table. This really was Mary's party. I could not have been more relieved, but it still took me another 15 minutes or so to get my blood pressure down to normal and relax, especially because I had kept all of my thoughts to myself for the previous hours. Finally, sheepishly, I told Mr.4444 about my suspicions and how relieved I was, and his eyebrows furrowed. "What were you so afraid of?" he asked, looking at me like I was crazy. And I could not answer his question. I'm still thinking about it. Please note the #self-absorbed tag on this post; yes, I realize I may need therapy.